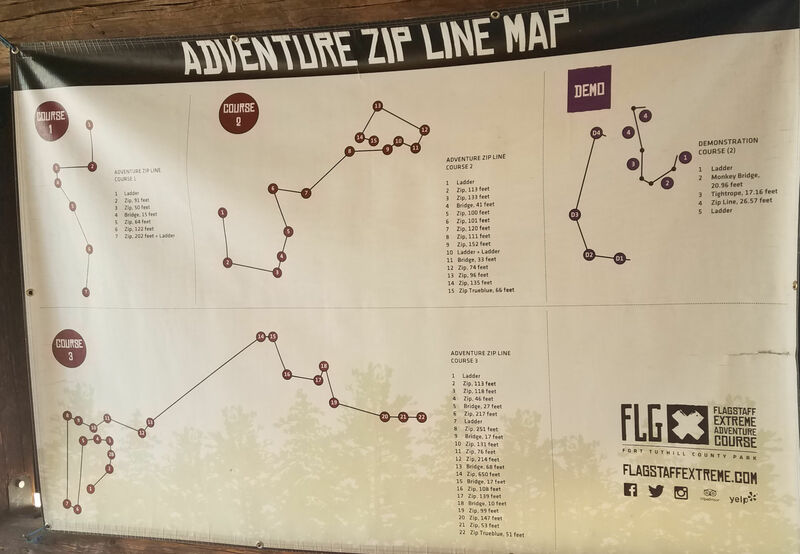 There are 30 zip lines within the 3 zip line course. The zip lines are suspended 15 – 80 feet high. With the highest tree stand platform over 70 feet above the ground. All surrounded by Ponderosa Pines. 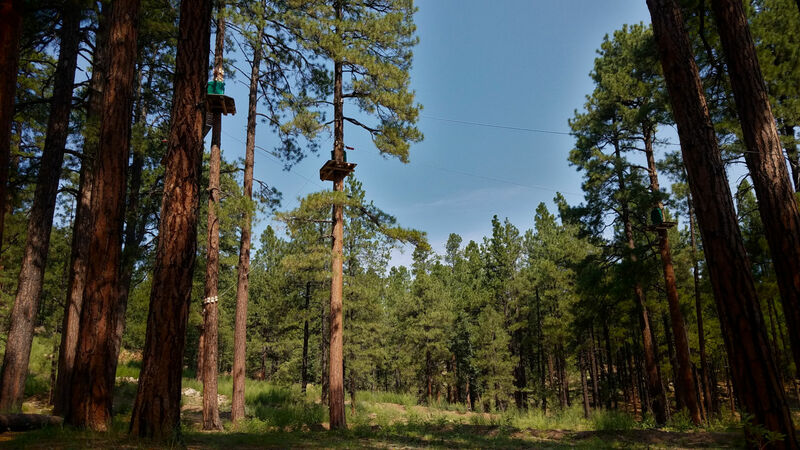 Here are 5 tips for Arizona zip line adventure. We registered online for a time slot. I am glad we did because it is a very busy place. If you arrive without a set time, then you might have to wait a few hours before you can jump in. For safety reasons they only allow so many people, each 30 min start time. You will defiantly want closed toe shoes. 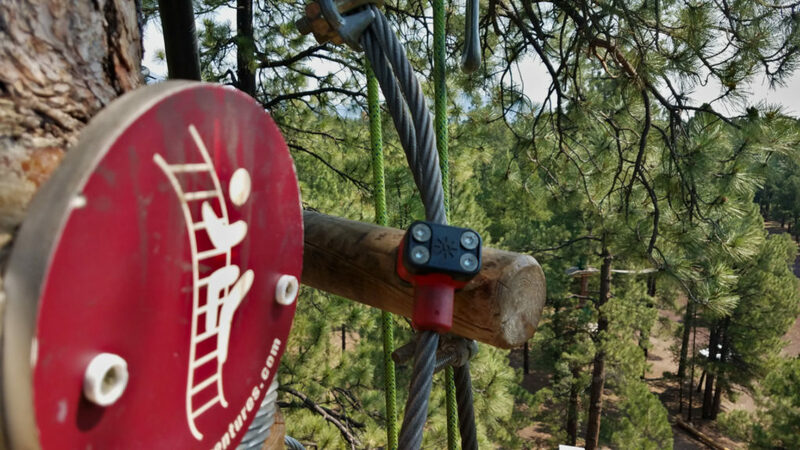 At the start of each of the 3 zip line courses, there is a ladder. Even though it looks easy to climb up and you are tied into the safety line, the ladders were the more challenging part for me and good shoes helped. No matter what time of year it is in Arizona, you should be drinking water. There are water stations at the end of the courses. We brought our water pack in a hiking backpack. The hiking backpack made it simple because we always had water when we were up in the trees. The backpack was not a hindrance for the zip lines cords. On each tree platform for the next zip line, there is a sign with a fact. 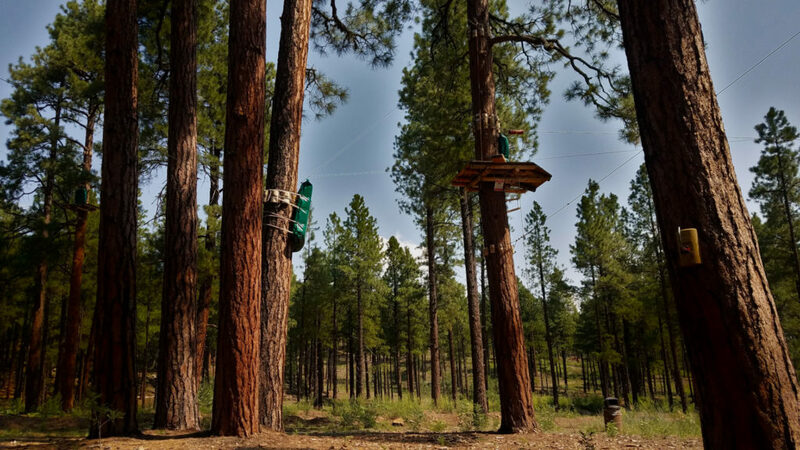 The facts are about Flagstaff and the adventure course. It is fun to learn the history of the area while climbing in the trees. This is not an activity for those who are afraid of heights. Since it is a self-guided course, you are on your own to zip from tree to tree. You also get to “Walk the Plank” at the end of 2 of the courses. 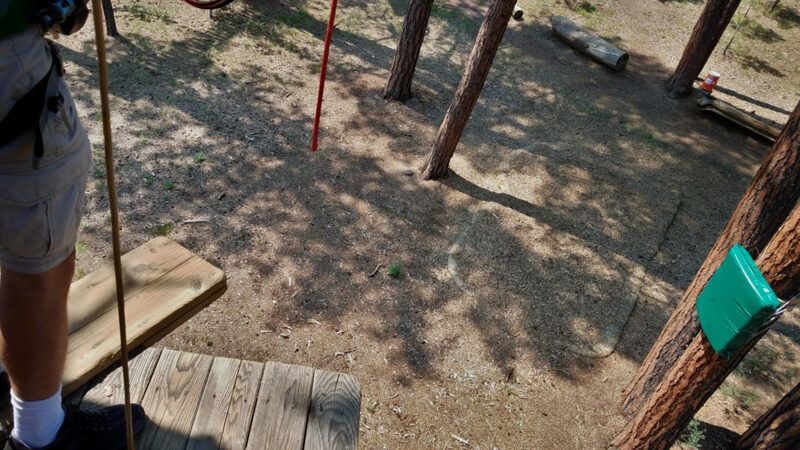 You get to swing out or just drop down from the tree. Many people must swing out because the nearby trees have large pads on them. Not sure if the pad is to protect the human from getting hurt by the tree or to protect the tree from the humans. Have you ever been on a zip line? Would you try a zip line? This looks like fun! It has been a while since I have been to Flagstaff. You reminded me that I need to plan another trip there. We are planning on visiting Arizona and I am so glad I came across this! Great tips, and helpful information! Thanks!!! We’re in Phoenix and my daughter lives in Flagstaff. We’ve never actually tried the zip lines though. We might have to look into it the next time we’re up there. I love zip lining. I need to get a trip to Arizona!! Looks fun. I’ve never been to Arizona, but if I ever get out that way, I’m going to have to try this out. Do you know the age minimum for this zip line? This is awesome! Had no idea you could do this in AZ!!! This would make a great experience present, haha! This is so cool. I’m planning a family reunion in flagstaff this might be a great idea to do. What fun! I haven’t done a zip line course in years, but they are so fun!!! How fun that there’s a little bit of history at each station! Cool idea. Yes, we climbed up ladders. Each course moved higher above the ground. Ohy! This looks so fun and SCARY! Our town just installed a zipline over the Erie Canal. I hope to try it out before the end of the season!! I grew up in Arizona, but we never really went to Flagstaff. Tucson was more our jam. This zip line looks great though! I love that the last tip is bring your guts! So true. Ziplining is not for the faint of heart, but it is so much fun!